You are the San Diego executor or the San Diego administrator of a loved one’s estate and it can be extremely overwhelming. There are tasks and timelines to consider, as well as, the personal property of the decedent and then the preparation, marketing and successful sale of the decedent’s home. The San Diego probate real estate is often the most valuable asset held in the San Diego probate. Having a Certified Probate Real Estate Advisor (CPREA), like me, is crucial to your success and ease of dealing with the personal property, and the home of the decedent. Many San Diego executors and San Diego administrators do not live near the San Diego probate home. Having a CPREA help with these tasks to be maintained and completed quickly will relieve the stress and anxiety that San Diego personal representatives can experience. When the San Diego probate home is ready to be offered to homebuyers having a CPREA lead you through California’s probate real estate process is critical to your success and comfort throughout. 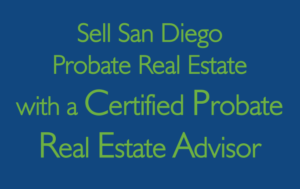 Most San Diego executors and San Diego administrators have full authority under the Independent Administration of Estates Act or IAEA allowing you to proceed with the preparing, marketing and successful sale of the San Diego probate real estate. What that means, to you, is that you can team up with a CPREA and consider offers to purchase. As your probate real estate expert, I will negotiate offers to get you and the estate the highest price and best terms. I think of the estates money as my money, and when it comes to saving or making you money, you can feel comfortable that I have your back. Once we have negotiated the best offer, then my team will open escrow and email your San Diego probate attorney that we are starting the next phase of the selling process. Your San Diego probate attorney will draft a Notice of Proposed Action (NOPA) and mail it to all the San Diego probate beneficiaries. This starts a timeline for the beneficiaries to have the option of objecting to the proposed action (the sale of the San Diego probate real estate) or within that time period when there are no objections, the NOPA expires and we can complete the sale. This article is the basic benefits, for you, when working with a San Diego probate real estate expert, with a CPREA designation. As in much of life, every situation is different, and your circumstances will always have something unique that needs to be addressed. You can feel comfortable knowing that when you team up with a CPREA, like me, you will have the best possible experience and just as important, you will get to “press the easy button”.